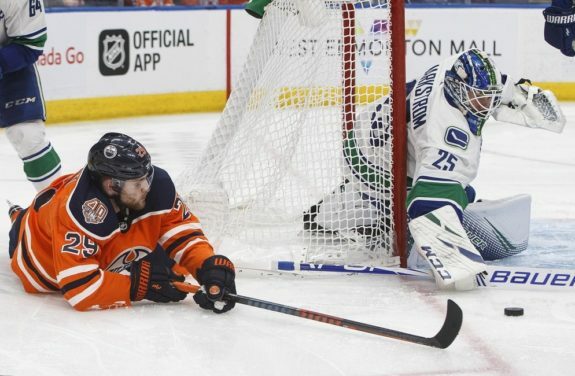 EDMONTON — Elias Pettersson and Antoine Roussel each had a goal and an assist as the Vancouver Canucks scored four goals on their first six shots and cruised to a 4-2 victory over the Edmonton Oilers on Thursday. Tyler Motte and Brock Boeser also scored for the Canucks (18-18-4), who are 7-2-1 in their last 10 games. Ryan Nugent-Hopkins and Leon Draisaitl replied for the Oilers (18-16-3) who have now lost four straight. Oilers goalie Mikko Koskinen gave up all four goals and made just two saves before being replaced by Cam Talbot, who stopped all 14 shots sent his way. Vancouver started the scoring with a goal on their first shot of the contest four minutes into the opening period, as Motte took a feed in the slot and beat Koskinen for his sixth goal of the season. The Canucks would score on their second shot as well a couple minutes later, when Pettersson sent it in front to Boeser, who notched his 13th goal. Edmonton got one of those goals back midway through the first period, when Connor McDavid found Nugent-Hopkins in front for a power-play goal on Markstrom. It was the first time in 10 games that Vancouver had allowed a power-play marker. Vancouver made it 3-1 with just over a minute left in the first on just their fifth shot, when Pettersson tucked the puck under Koskinen’s arm, giving the rookie his 18th. The Canucks got their fourth goal on their sixth shot of the game at 19:49 off a giveaway in front, which Roussel put away for his fourth. It was the first time in nine years that Vancouver scored four goals in the first period of a road game. Talbot came in to start the second in the Edmonton net. Edmonton clawed back with a second power-play marker seven minutes into the second period on a deadly wrist shot by Draisaitl. The Oilers actually outshot the Canucks 32-20 in the game. Both teams are back in action on Saturday as the Canucks head to Calgary to face the Flames and the Oilers host the San Jose Sharks. Notes: It was the second of four meetings between the two teams this year, with the Canucks defeating Edmonton 4-2 on Dec. 16. The next meeting will be on Jan. 16 in Vancouver… Oilers forward Alex Chiasson left the game after taking a shot off of the knee in the first period and did not return.